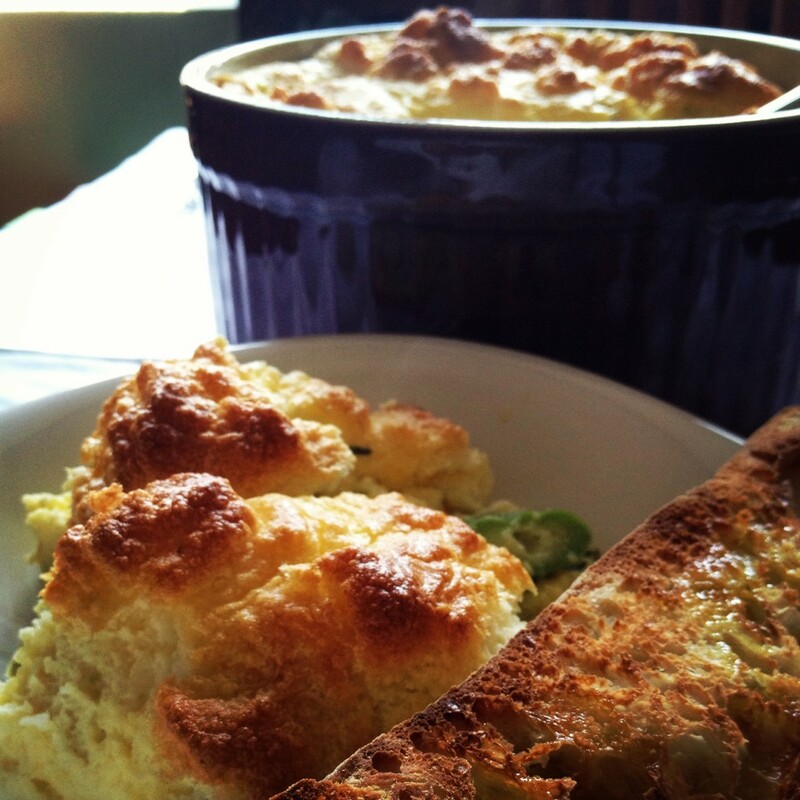 Mom was the queen of soufflés. She could whip them up in a snap, creating a velvety béchamel while she talked on the phone. She whisked egg whites to perfection, achieving a cloud-like consistency she delicately folded into the shiny batter. This was one of her signature dishes that would brighten up any special occasion at home, as well as our weekly Saturday family lunches on the terrace. When I was a little girl, my parents would take us out to eat pizza, usually after school functions, to celebrate birthdays or early Sunday nights. We would go to Pizzarelli, the quintessential Dominican pizzeria, or Pala Pizza, another chain run by Italian family friends. All the pies were wonderful, sweet and tangy, perked up with enough extra local oregano and albahaca needed to satisfy the Dominican palate. The taste and smell of these Dominican pizzas has been forever embedded in my senses, yet it was the way they were created that gave me the most pleasure. I would watch the pizza maker pull and stretch the dough until it was pliable enough to toss in the air, and wouldn’t take my eyes off the flying disk. For a 7-year-old, the process was hypnotic and as cool as the most dazzling magic trick. I give you this background because walking home today, my memories of pizza pie were stirred up like the particles inside a snow globe. I discovered a new pizza joint in my neighborhood. Even though there is tough competition–a few blocks away pizza is sold by the slice for 99 cents–this place is unique. Capizzi Pizzeria is warm and inviting, with wooden tables, a vintage fridge, and assorted knickknacks on the walls. The restaurant specializes in Sicilian-style pies and features four kinds on the menu plus a list of toppings that includes caramelized onions, sausage, roasted peppers and garlic. Joe, the owner, is a friendly guy, and according to one of the servers, opened the restaurant in honor of his Grandmother. I wanted to stay, but in my haste to finally make it home after a long, strange week, I waited for my pie at one of the tables while I sipped some water. 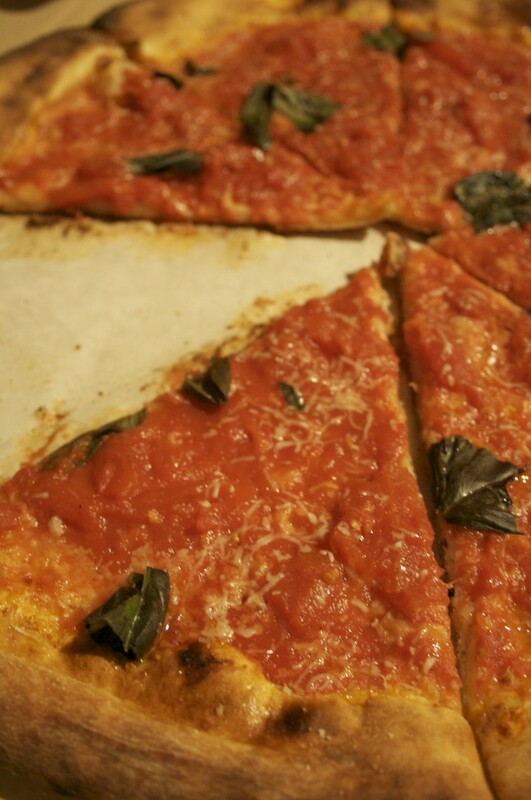 I looked at the chef preparing my pie, happily flinging the dough high into the air and dressing it with the San Marzano tomatoes and parmeggiano before sticking it into the brick oven. Even though I couldn’t hear him, I could swear that he was whistling. I raced home, hugging the pizza box, in order to keep the pie warm on this nippy night. I bolted through the door and laid the box on the kitchen table. After settling in, I picked up a slice and carried it with me to the couch. With the first bite vibrant red tomatoes popped on my tongue. The cheese was sparse, yet full of flavor. The dough was light and fluffy. As I polished 1, 2, 3, 4 slices, the flavors reminded me of a bowl of spaguetti. It tasted like something Grandma would have made–it was sweet, bright and made with love. When you think of Thanksgiving, what is the first thing that comes to mind? For me it’s a can of jellied cranberry, which I thought was the best cranberry sauce in the world. It is when I moved to the northeastern U.S. that I suddenly started thinking twice about it, and eventually got more snobby with my cranberry sauce, choosing more natural interpretations that could be traced back to the actual fruit. What I finally realized was that what I had been serving with turkey all those years, was a far cry from the deep burgundy sauce prepared in kitchens all over the country with sugar, water, spices and of course cranberries. In the Dominican Republic, unless you’re somehow linked to the U.S.(have family here, have studied here, have an American spouse, etc), Thanksgiving is not a popular holiday. In my home though, the celebration was welcome every year. Mom instituted the tradition after celebrating it herself with her own family. Although the stories were always nebulous, I gathered that her father, my grandfather, had lived in Puerto Rico and had himself adopted the tradition. Decades later, my kitchen in Santo Domingo buzzed whenever Turkey day would come along. My aunt Tiita took over one of the counters, mixing her secret “Russian” potato salad adding a little of this and a little of that until it was just perfect. Mom pulled out the glistening golden turkey for one last baste. Plantain pasteles filled with shredded chicken boiled in a huge pot. Piping hot rice with kidney beans (moro) was scooped into a huge bowl, sweet potato casserole with marshmallows toasted in the oven. The table was set. The feast was underway. I had the task of slicing the cranberry “sauce”. I loved the feel of my knife going through the shiny jelly shaped like its can. I loved how each ring was equal to the next and I took pride in lining them up, each one resting on the next. Then families and friends who had gathered on the terrace enjoying the (hopefully) cooler breezes of November and laughing and drinking would gather round the table. My Mom would give thanks, her spirit as bright as her blond bob. We would dig into the spread of American and Dominican dishes, and forget that these moments existed only for that day. In our minds, they would always come again, they would last forever. It’s been a wet summer. The sun came out today first time this week. I packed a tote and ran to the park, trying to beat the rain. Now I lay here and feel it on my arms, along with ripened mulberries that fall around me like confetti. Above me a squirrel feasts away. On days like these, I crave something sunny and bright to lift me up and take me back to the sticky summers in the Dominican Republic, playing outside the whole day and cooling off with a vigorous dip in the neighborhood pool. It also reminds me of fruit from home: guanábana –soursop– green and spiky with white creamy flesh, mangoes from Baní bright and sweet as candy, cherries, tiny tart and tangy that we used to blend into juice. Inspired by care-free days and Mexican Aguas Frescas(refreshing drinks of fruit and water), I’ve taken plump Rainier cherries bursting with antioxidants and vitamin C, and prepared something that cools you off and lifts you up, perfect for those rainy summer days. Pit cherries(I smash them with the side of a knife and pull the pits out). Blend with water and sugar. Pass through strainer to remove skin. Pour over a glass full of ice. Cheers! At home, we call it berro. I remember my Mom snacking on it happily, trying to convince me to try it by raving about how nutritious it was. I would nibble on a stem and spit it out, my 10-year old palate tortured by its bitter bite. Fast forward 20 years and inspired by this memory of youth, I find myself ordering it at Libertador, an Argentinian parrillada restaurant in the neighborhood that opened its doors a few weeks ago, bravely emerging in the midst of it all. It is a warm airy space with an open kitchen where the chef skillfully grills classic cuts of Argentinian beef like lomo, entraña and bife. During my visit, before indulging in a tender yet beautifully charred skirt steak, I dug into a watercress salad dressed with garlic. The sweetness of the garlic was a successful balance to the pungency of the green; however, its quantity weighed down the leaves, turning the dish into an edible guard against vampires. Coming home a bit discouraged but bitten by the watercress bug, I rummaged through my cookbooks and found a delicious way to incorporate this ingredient into a simple dish that takes me back, yet settles me into the present with its refreshing yet comforting flavors. Season potatoes with olive oil, salt and pepper and roast until golden at 375C(about 45 min.) In a bowl, combine lemon juice, zest, olive oil, vinegar, sprinkles of salt and sugar. Let rest until potatoes are done. 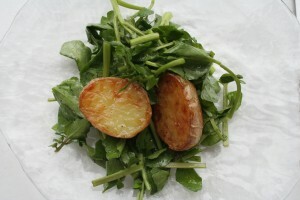 Add potatoes to watercress and season with dressing. Whenever I traveled to the U.S. over summer holidays, there were two tastes that confirmed I had arrived in this country, which back then seemed amazing and strange and wonderful. When landing in Miami, our first stop would always be a car rental office. We loaded our luggage into one of those buses with the alley in the middle and sat in anticipation. There was just the four of us: my parents, my twin and I, so we always found room. There was always so much anticipation-I remember looking out into the street through the tinted windows of the bus and being enthralled by all the traffic, the chaos and the order. When we arrived at the rental office, while the parents decided on a car, which would usually be a Buick or Chrysler or some other staple of Americana, we would beeline straight to the vending machine to get the first taste of our trip. Doritos and a Coke. We would indulge in it shamelessly, coloring our fingers orange and taking desperate swigs of the cold fizzy drink. They were perfect for each other. This combination is a good example of returning to the simple things in life, or Obamanation’s encouraging Back to Basics mentality as a practical approach to the hiccups of the day.